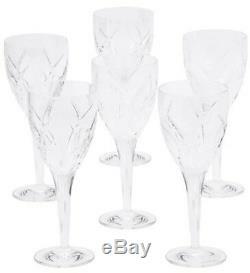 John Rocha Waterford Crystal Signature Red Wine Glasses (Set of 6). 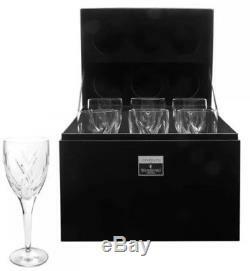 Brand new in Large Waterford presentation gift box. These Signature Red Wine Glasses feature an elegant, contemporary cut pattern, perfect for accentuating the aroma and taste of full-bodied red wine. Hand-crafted fine lead crystal stemware by renowned designer John Rocha, combining artisan craftsmanship with the clarity and comforting weight and stability for which Waterford has become world famous for, making any occasion a memorable one. Tall and weighty, each glass stands just over 9" high with 3-1/4" across upper rim, etched with "John Rocha" and "Waterford" on the bottom. 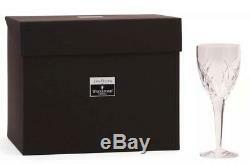 The item "WATERFORD JOHN ROCHA Crystal Signature Set 6 Red Wine Glasses NEW IN BOX" is in sale since Sunday, January 6, 2019. This item is in the category "Pottery & Glass\Glass\Glassware\Waterford". The seller is "braylonleesmommy" and is located in Altamonte Springs, Florida. This item can be shipped to United States, Canada, United Kingdom, Denmark, Romania, Slovakia, Bulgaria, Czech republic, Finland, Hungary, Latvia, Lithuania, Malta, Estonia, Australia, Greece, Portugal, Cyprus, Slovenia, Japan, China, Sweden, South Korea, Indonesia, Taiwan, South africa, Thailand, Belgium, France, Hong Kong, Ireland, Netherlands, Poland, Spain, Italy, Germany, Austria, Bahamas, Israel, Mexico, New Zealand, Philippines, Singapore, Switzerland, Norway, Saudi arabia, Ukraine, United arab emirates, Qatar, Kuwait, Bahrain, Croatia, Malaysia, Brazil, Chile, Colombia, Costa rica, Panama, Trinidad and tobago, Guatemala, Honduras, Jamaica, Antigua and barbuda, Aruba, Belize, Dominica, Grenada, Saint kitts and nevis, Saint lucia, Montserrat, Turks and caicos islands, Barbados, Bangladesh, Bermuda, Brunei darussalam, Bolivia, Ecuador, Egypt, French guiana, Guernsey, Gibraltar, Guadeloupe, Iceland, Jersey, Jordan, Cambodia, Cayman islands, Liechtenstein, Sri lanka, Luxembourg, Monaco, Macao, Martinique, Maldives, Nicaragua, Oman, Peru, Pakistan, Paraguay, Reunion, Viet nam, Dominican republic, El salvador.